My first tulip ‘Early Harvest’ is out! These, unlike most other tulips, flower extremely early, long before the rest of the garden has had a chance to wake up. They are, however, 10-14 days later than usual this year. The contrast of the bright orange against the brown soil is uplifting to say the least! I have also got another early tulip already showing… can’t remember what it is, but perhaps it will come to me when it opens fully. As usual, things are moving along rapidly now that the hard frosts have given way to some mild damp weather, and early spring means the bees are HUNGRY… this little fella couldn’t wait for the bud of the Chionodoxa (‘Glory of the Snow’) to open, and just scrabbled around until he managed to open it himself! These splashes of colour are so welcome, and I hope they brighten your day too! This entry was posted in Bulbs, Garden, Nature and tagged Animals/Creatures, Garden, Nature, Spring. Bookmark the permalink. They have brightened my day! In central Maine, there is still snow on the ground, but it is melting. No flowers yet, but spring is coming. Cathy, I’m glad you do not have snow and instead have a sunny day. Your Tulip “Early Harvest” in orange is fantastic. The other pink tulips I love. The bee had many strengths! He managed to open the beautiful Chionodoxa “Glory of the Snow”. 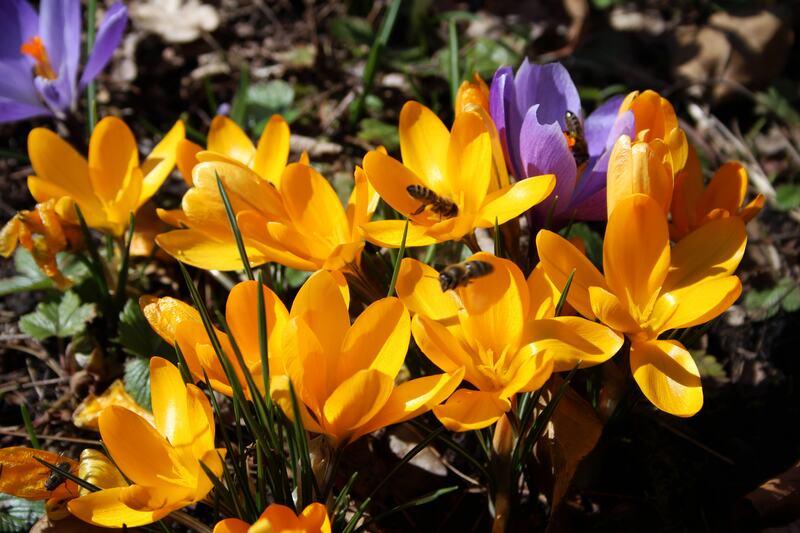 Yellow crocuses full of bees are divine. Yes Cathy, I have been very happy the day to see your first beautiful flowers full of color. Also enjoy yourself a happy Easter weekend. Take care. Greetings from Margarita. It was funny watching the bee struggle. He gave up on one bud that remained firmly closed and just went on to the next! LOL! Cathy poor bee: she wanted that floral button because she liked it. A little stubborn yes that was, well a little no, very much. 🙂 🙂 🙂 But deep down I wanted to feed. Greetings from Margarita. your crocus are really stunning, no wonder the v]bees enjoy them. I’m so glad you have sunshine at last! Thanks Pauline! I am glad too! It has been a long winter! 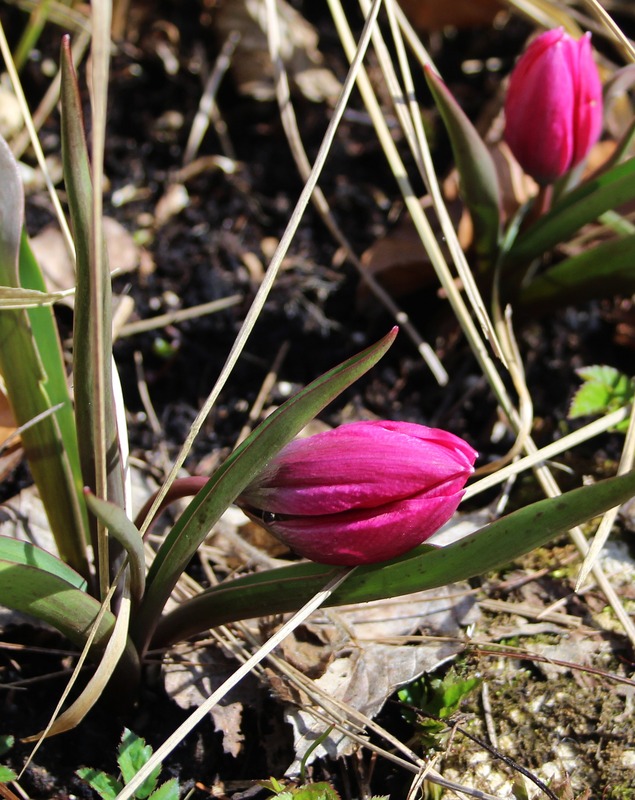 The first bulbs are such a delight to see – yes, this definitely cheers me! Today, I picked some snowdrops for a little vase, their fragrance is so delicious! Happy Easter to you as well, Cathy! Some of my snowdrops were still looking good a few days ago, but are starting to go over now… very late for us. 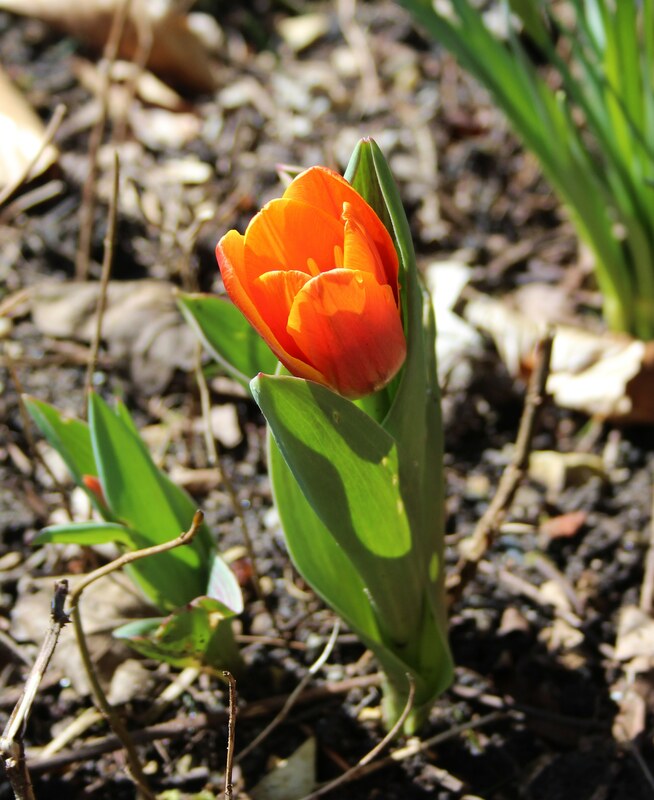 I checked on my blog for past years and I had Forsythia and this tulip open mid-March or earlier. Enjoy your snowdrops Eliza! Spring! SPRING! I love your tulips, Cathy, but more importantly I love how they’ve brought you so much cheer. Enjoy! Unique moments in the garden, so blessed to enjoy them as gardeners! Absolutely. Have a lovely weekend Anca! COLOR!! Wonderful. I hope you have a great weekend too. Oh Cathy, those are GORGEOUS!! I love the deeply saturated oranges and pinks. Yes, I do love the constant change. Even in a vase, they grow. At last, at last. Spring is teasing us here. One day it’s here the next is winter again. Enjoy it while you can. Yes, it has been exceptionally cold this spring, but it seems we will now get a warm spell at last. Hope it spreads to your region too! When I watch the bees I often think of you Amelia! I am always amazed how quickly they appear when the first crocuses open! So lovely to see these wonderful colours and tulips – hooray! Have a lovely Easter weekend,Cathy. Such pretty spring blooms. We have to wait for sunny days to enjoy our crocuses but they are worth the fleeting moments. Happy Easter Cathy. Happy Easter Cathy. Enjoyed seeing your beautiful tulips. The bright yellow crocuses really say spring. Yes, that orange is a welcome sight. I can’t grow Tulips because the rabbits eat them. 😦 A few of my flowering bulbs are appearing and blooming, but you are ahead of me. Happy spring! Happy Easter! Thanks Beth. Happy Easter to you too! I love ‘Early Harvest’. It typically has bloomed by now. Last year it was ravaged by rabbits. This year it hasn’t formed buds yet. I’m going to sprinkle it with rabbit repellent and see if that helps. Mine was late this year too, but it always surprises me, seemingly springing up from nowhere within a couple of days! Hope the rabbits keep away from yours when they bud. I agree. Thanks for visiting!